Late summer sticky purple geranium. 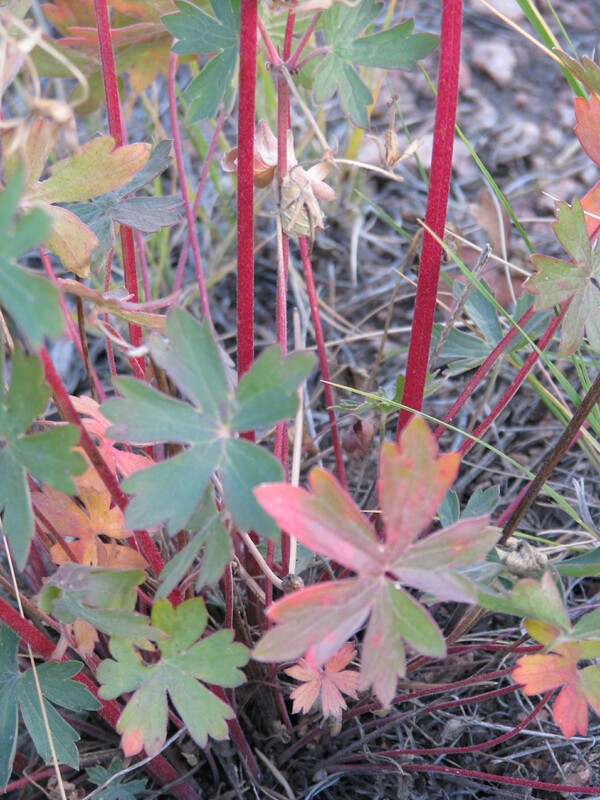 A fringe of scarlet on the leaves of a Rocky Mountain maple. The fade to gold in the cottonwoods. A landscape gone tawny under sun-cured grasses. Short glossy hairs dropping off the horses, replaced by fuzz. Frost-blackened leaves curling on the beans, the squash, and the tomato plants. All of which raises the question: Where did summer go? Sure, fall doesn’t officially kick in for a few more days, but my body knows it’s here. The sun’s seeking a lower angle to my eyes. I close the hall window at night. It’s still dark when I wake up in the morning. I walk outside and smell hay and dust, not greenery and damp soil. I had grand plans for the summer: to ride the horses, to give the garden more care and nurturing, to hike more, to spend more time reading on the deck, to go camping. Instead, I found myself embroiled in a daily litany of Gotta-do. The everyday chores of house and garden just barely fit in the open spaces between work, houseguests, errands in town, and one fairly significant home improvement project. True, I did begin work on a new writing project, which filled in the crannies of available office time. And there was a sick horse here and a computer meltdown there. Still, I found myself collapsing in the chair each evening, weary and sore, confused and exasperated: How was it that all the bustle had barely whittled away at the daily list? When I try to reconstruct what, exactly, has kept me in an incessant state of overwhelm for months, I’m mostly at a loss. Yes, there was the blizzard of book pages as multiple indexing projects landed on my desk simultaneously, just as company was arriving and in the midst of the long-overdue rebuilding of the tile roof deck. But that was July. Whither June? And August? I blame the weeds. After several years of drought, a pretty normal winter and wet spring snows were followed, after a parched June, by a decent monsoon season that brought on wildflowers and grasses galore. Unfortunately, the weeds have been just as exuberant, if not more so. And so I mowed the roadsides. I weed-whacked weedy patches in the horse pastures. I grubbed up undesirables in the garden and landscaping beds with a spade and a dandelion fork. I sprayed distilled vinegar. And I pulled. And pulled. And pulled. 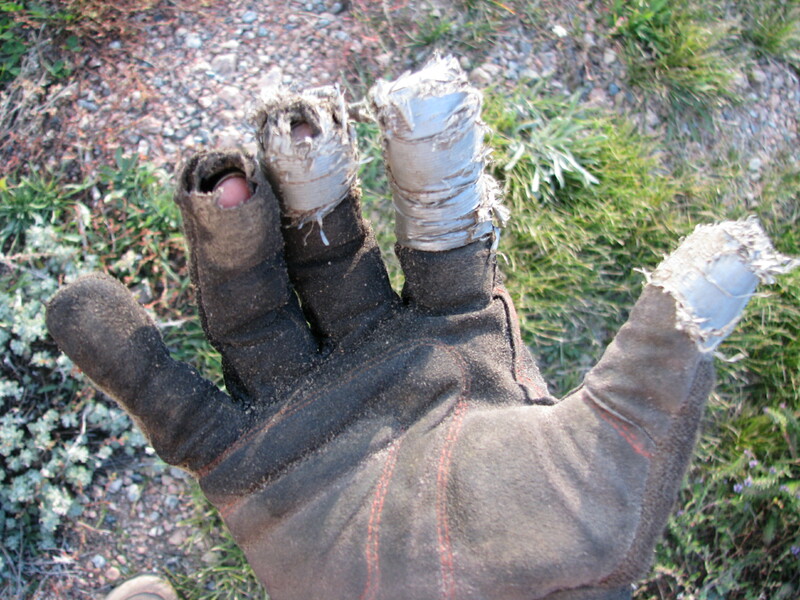 Weeding gloves; a few new duct tape patches and they’ll be good as new. And I’m pretty sure that’s where my summer went. To peppergrass and cheat grass, to kochia and lamb’s quarters and bindweed. To yellow sweetclover, western sicktights, redroot pigweed, tumbleweed, Canada thistle, and hoary cress. I spent hours at a stretch getting dusty and sweaty, wearing holes in my gloves that I patched, over and over, with duct tape. My back ached, my hands hurt, my hamstrings burned. The weeds will be back next year, of course. Not as many as there would have been, but the pesky hordes will return to taunt me with their easy-growing ways and their profuse seeds. I weed because I think it matters, because I believe persistence and incremental progress will give the native plants more opportunity to make good use of the space and water opened up to them. But when I’m being more deeply honest, I’m forced to admit that the weeding chore also floats to the top of that interminable to-do list because I like weeding. Maybe not for six to eight hours a week, which is what I reckon I averaged this summer. And not using the mechanical methods, with a mower engine howling in my ears or trimmer motor vibrating my knuckles. But pulling and digging are curiously satisfying. Keeping aggressive invaders at bay gives me the sense that I’m doing my part for the landscape. I enjoy the time spent outside. And unlike time spent indexing or writing or catching up on the bookkeeping, weeding leaves my mind free to wander. Weeding has become meditative: I feel like I’m present in my life, yet also gently detached, walking on a parallel path for a time. I’m still making headway, still getting something done, but the work is easy. The motions are familiar and, for the first hour or so, I feel capable and fit. I’m “busy” doing something I think needs doing, which silences the inner voice that’s usually screeching about the next chore on the list. And since the task is endless, the satisfactions that come of it are in the doing, not the having done. This entry was posted in change of seasons, gardening, weeds. Bookmark the permalink.